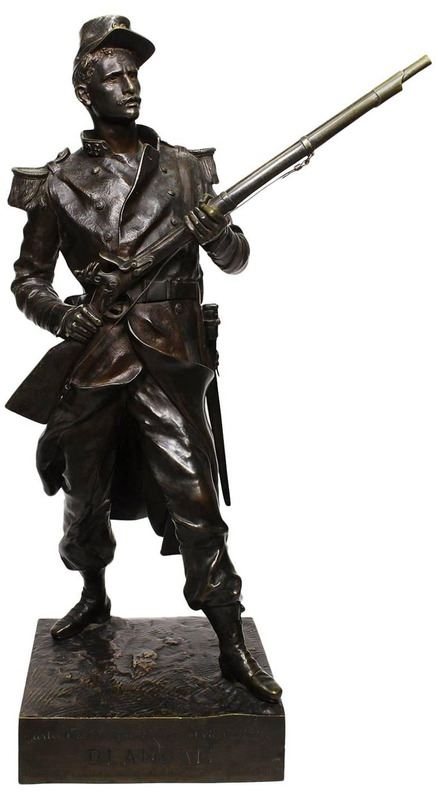 A Very Fine French 19th Century Patinated Bronze Figure of the French Hero of the Algerian Conquest, Jean-Pierre Hippolyte Blandan (1819-1842) after the French Sculptor Jean Gautherin (1840-1890). The standing soldier in full military garb holding his rifle in guard ready to attack. 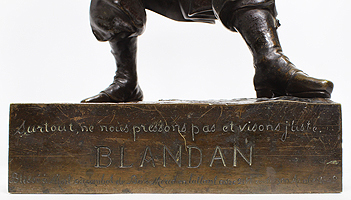 Inscribed "Surtout, ne nous pressons pas et visons juste BLANDAN Blessé a Mort au combat de Bein Mercd en luttant avec 21H Contre 300 arabes 1849" on front base and "Jean Gautherin, Hors Concours" on right side. Circa: 1880. Jean Gautherin was a French sculptor born in the Village of Ouroux in 1840 and died in Paris in 1890. He began his studies at the l'école des Beaux-Arts in 1864 under professors' Gumery and A. Dumont. He wins awards for his works in 1868, 1870 and 1873. In 1878 Gautherin was named "Chevalier de la Légion d'Honneur". He begin exhibiting at The Salon in Paris in 1865. He is best known for his statue of "Diderot" at the Place Saint-Germain-des-Pres in Paris. Benezit-Dictionnaire Des Peintres, Sculpteurs, Dessinateurs Et Graveurs by Gründ, Volume 4, page 643 (Ninth Edition).